Instructor Claude Harmon III and Dustin Johnson. As one of the top instructors in the world, Claude Harmon III's stable is loaded with some of the biggest names in the sport, including Brooks Koepka, Dustin Johnson and Rickie Fowler. All three players spend countless hours with Harmon over the course of a season fine-tuning their game, but due to their hectic schedules, it's not always possible for instructor and student to carve out three or four hours to grind on the range. With golf becoming more data-driven, Harmon no longer needs to worry about finding time for lengthy sessions. 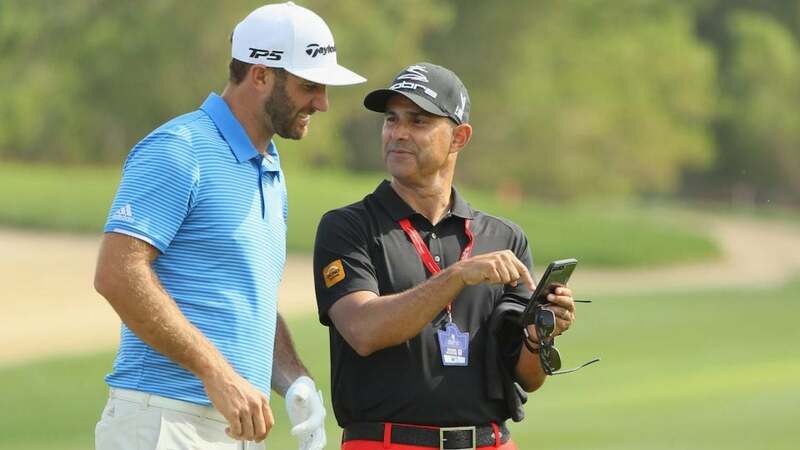 During weeks when the PGA Tour's ShotLink system is up and running, he can follow along in realtime and use Strokes Gained data, along with shot-by-shot info from each round, to tailor a practice plan for each player. For example, Harmon used ShotLink data to pinpoint an issue with Johnson's wedge game after the 2015 season. In the months leading up to 2016, Johnson would go on to spend an exorbitant amount of time working specifically on his short game in an effort to tighten up his yardages and accuracy. "We looked at his wedge stats and didn't have to guess if he was a bad wedge player," Harmon said. "The data told us he needed to improve in that area of his game. Just putting work in, he spent time grinding on the range to improve on that area, and the results showed the next season when he won the U.S. Open. The data these players have access to is so powerful. If you're not looking at what you're doing when you're playing golf, it really doesn't matter." For the best players in the world, their round-by-round data and statistics are only a click away. But that hasn't been the case for 99 percent of the golfing population until the last few years when companies like Arccos Golf came into the picture. With the help of built-in grip sensors that weigh a mere 4.6 grams, golfers are able to tap into Arccos' mobile app and track each round, shot-by-shot, to get an accurate snapshot of yardages with each club to figure out areas of their game that need improvement. It's essentially the closest thing a recreational golfer can get to the Tour's version of ShotLink. In fact, Arccos data has been so impactful that Harmon started requiring the junior golfers he teaches to use the grips. For Harmon, the grips allow him to cut down on the amount of time typically spent going over previous tournament rounds to figure out what went right, wrong and needs to be worked on during the practice session. "It allows us to waste less time during practice rounds," he said. "I already know what's going on. Driver and putter look good, but your irons sucked, so let's go out and work on that part of your game during today's session. It's the same thing we're doing on the PGA Tour. We don't have a lot of time to play the guessing game. "We're always trying to look for that competitive edge, and the average golfer thinks that means spending nine hours on the driving range. The competitive edge might be, based on the amount of time, lifestyle and talent level, to play smarter." In addition to helping Harmon tailor practice plans for each one of his students, the shot-by-shot data has been invaluable in pinpointing incorrect yardage gaps within the bag setup. While it takes roughly 7-10 rounds to get an accurate picture, the app offers a space that lists average yardages for every club currently in the bag, based on practice and tournament rounds logged. By simply understanding how far, and often, a player really hits a particular club during the course of a round, Harmon is able to sit down with his students and figure out if a certain clubs makes sense for their current setup. "If you're only hitting the 3-wood a handful of times over the course of a few rounds, maybe it's worth looking into adding something else to fill a large yardage gap elsewhere," Harmon said. "That's the beauty of this system. It not only helps you pinpoint areas of the game that need work, but it's also intuitive enough to help you build a better setup for the clubs in your bag." Arccos' Caddie Smart Grips currently retail for $150 and come with 13 Lamkin Crossline 360 smart grips and one Arccos putter sensor. The grip sensors have already been embraced by Cobra Golf, who currently operates their own system, in conjunction with Arccos, called Cobra Connect.